Happy Friday! Are you trying to recover from a sugar hangover like me? I think I dipped into the Halloween candy a bit too much yesterday -- well, the whole week honestly. Sugar was really the theme around here as I spent a lot of my time working on the "Sugar & Spice" baby quilt that I posted about previously here and here. It is now complete and I'm here to show you the results. 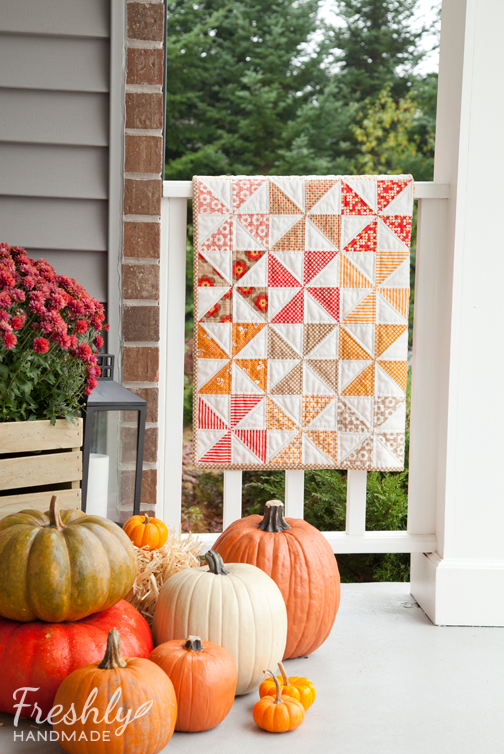 This quilt is made using 3" finished half square triangles and the the same autumn-colored fabrics from the "Pumpkin Spice" quilt that I finished last week, but this time I added in a solid white. 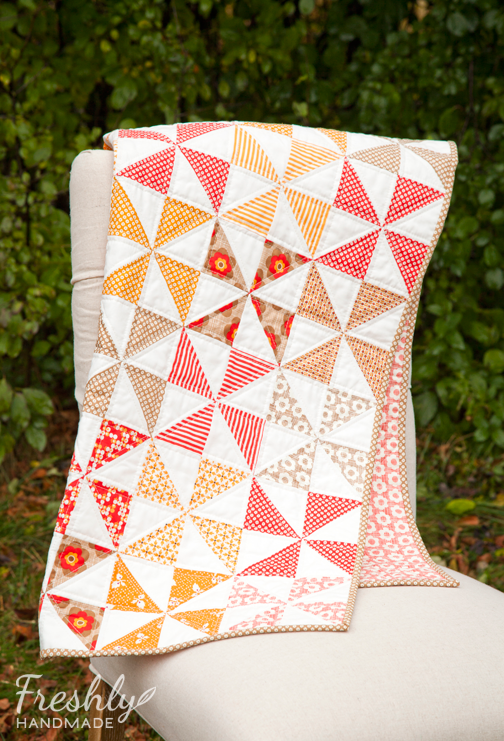 I also changed the pattern and went with a pinwheel design which I think looks so sweet. This quilt finishes at 36" x 42". 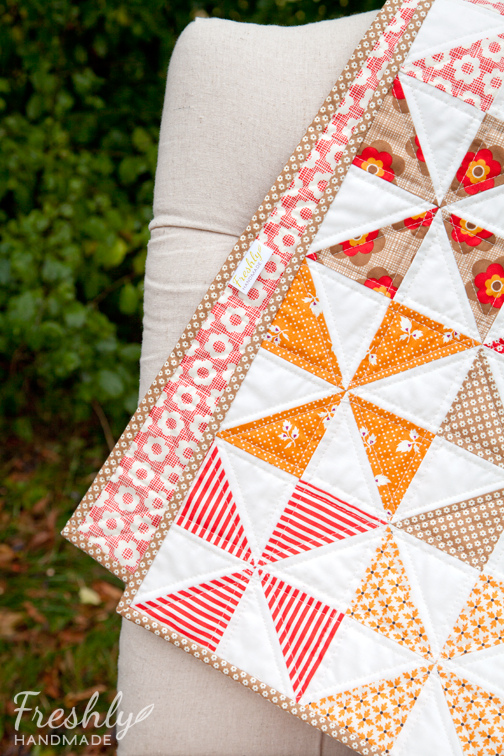 The backing and binding fabrics are both from the Boho collection -- prints that are also used in the quilt top. I quilted it using straight stitches about 1/4" from each seam. And, I had to get one more shot by my pumpkins before they are gone. These two quilts were really fun to work on this time of year. Whatever autumn inspired fabrics remain, now reside in the scrap bin. While I'm hanging on to every last bit of fall that I can, it's time to move on to my holiday projects. By the way, if you read this post, you know I was suppose to have a new little helper with me to take these photos, but she was napping. She'll have to get in on the next one. P.S. 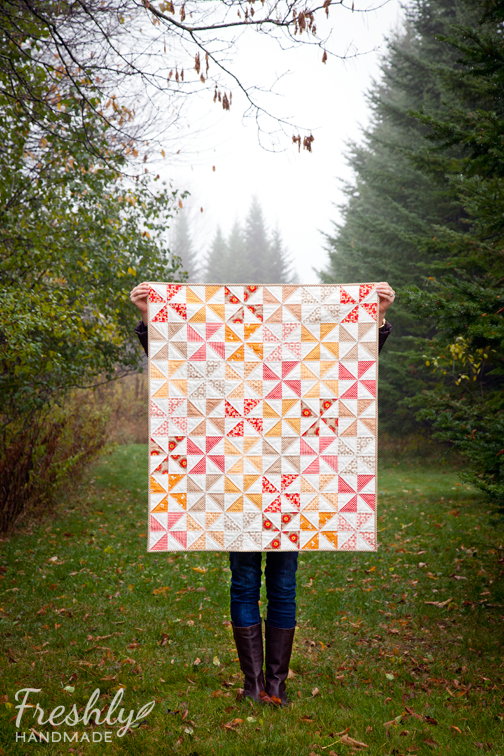 I am linked up to Amanda Jean @ Crazy Mom Quilts again for Finish It Up Friday. 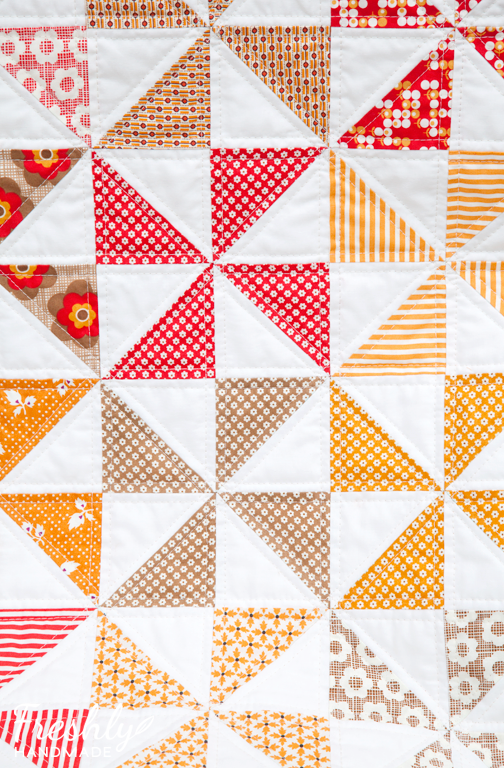 I think the quilt is just gorgeous - the pinwheels always look delightful and your colours are so pretty - well done! Love this in those lighter hue colors. The quilt turned out wonderfully! And what lovely photography! Great job! That picture with the pumpkins is just gorgeous! What do your quilt labels have on the and where did you order them?